The rear derailleur Shadow Plus doesn’t just reduce irritating chain slap, but also facilitates trouble free removal of the back wheel. Generally it’s easier to fit and remove the rear wheel if the chain is on the smallest sprocket of the cassette. 1. 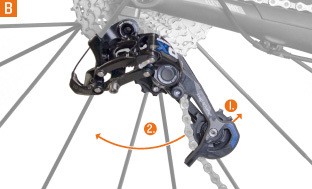 In order to fit and remove the rear wheel quickly and easily you actuate a small lever which is located at the top end of the derailleur cage of all Shadow Plus rear derailleurs. 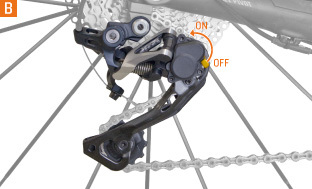 If you turn the lever to the “off” position, the tension on the derailleur spring is reduced, thereby allowing the entire derailleur to be moved more easily. 2. After you have refitted the rear wheel, you return the small lever to the “on” position. Picture 2 This increases the tension on the derailleur spring and thus reduces unwanted chain slap. 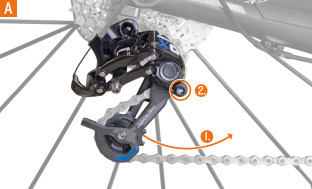 The new rear derailleur “Type 2” from SRAM doesn’t just reduce irritating chain slap, but also facilitates trouble free removal of the back wheel.